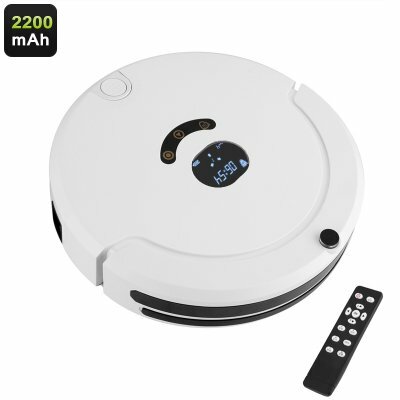 Successfully Added Aosder Robotic Vacuum Cleaner - 4 Cleaning Modes, 800Pa Suction, 2000mAh Battery, Automatic Recharge, Remote Control to your Shopping Cart. Take the hassle our of chores with this hard working robotic vacuum cleaner. The Aosder vacuum cleaner is a fun and effortless way to clean your home. With 800PA of suction, it can lift dirt and dust from your floor in no time and the smart navigation modes mean it will efficiently work its way around your home providing a comprehensive clean. A large 2000mAh battery lets this vacuum cleaner work for up to 90 minutes and when the power gets low it will return to the charging station until next time it is needed. The Aosder robotic vacuum has four cleaning modes random mode, spiral mode, 'Z' mode, and wrapping mode. It can be scheduled to clean at predetermined times and days. This lets the vacuum clean your home while you're out so you arrive back to a spick and span home every time. With the remote control, you can use the arrow keys to direct the vacuum cleaner to where you need so it can concentrate on dirty spots when a dedicated clean is required, you will also be able to adjust the speed and cleaning modes should you need. With a low profile, this vacuum cleaner can get under coffee tables and other furniture while the intelligent navigation guides it around your home avoid any collisions or hazards. An isolator box comes included and will let you closed of areas so the vacuum won't get tangled in wires or venture where it's not wanted, stopping it from waking up children or getting in your way. The Aosder smart vacuum cleaner comes with 12 months warranty, brought to you by the leader in electronic devices as well as wholesale smart home gadgets..
Arabic: - المكانس الروبوتية - Chinese Simplified: - 机器人吸尘器 - Czech: - Robotický vysavač - Danish: - Robot støvsuger - Dutch: - Robot stofzuiger - French: - Robot aspirateur - German: - Roboter-Staubsauger - Hebrew: - שואב אבק רובוטי - Hindi: - रोबोट वैक्यूम क्लीनर - Italian: - Aspirapolvere robot - Japanese: - ロボット掃除機 - Korean: - 로봇 진공 청소기 - Malay: - Robot pembersih vakum - Norwegian Bokmål: - Robotic støvsuger - Romanian: - Aspiratoare robotice - Russian: - Робот пылесос - Spanish: - Robot aspirador - Thai: - หุ่นยนต์ดูดฝุ่น - Turkish: - Robot elektrikli süpürge - Vietnamese: - Robot hút bụi.